Donald Mustard, creative director of Chair Entertainment (Shadow Complex), sees a bright future for gaming on a mobile phone. One so bright that in 2-5 years we'll be playing Gears of Wars on something that fits in our pockets. Chair, who are currently working on Infinity Blade for the iPhone, say that at first doing a game for a smartphone was just a diversion. "I didn't take it that seriously until we started making this game," he tells Eurogamer. "Now I'm like, 'Oh my goodness, this is literally going to be the best looking handheld game ever made'. It's way beyond what a DS or PSP could do. 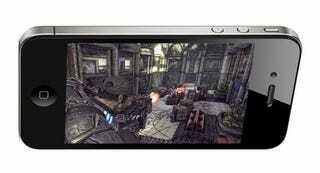 I think it's going to be an interesting future, especially if in two years we can really run Gears of War on an iPhone." Gears on an iPhone? Within two years? Well, maybe two years, maybe five, according to Chair's technical director Geremy Mustard. "If not two years, then certainly five years. Well, it could be as soon as two years but within five years that will certainly be the case. It will at least be powerful enough to do that." Sounds fantastical, but then you remember how amazing Epic Citadel looks on an iPhone 4, and suddenly that prospect becomes very, very real. Here's hoping in 2-5 years' time somebody has worked out a way for phone games to not be a horror to control!